The ReSet series of resettable manual call points mimics the feel of breaking glass whilst offering the user the benefits and environmental advantages of a resettable operating element. Several switching arrangements are available including a version for 2-wire systems. Once installed, the ReSet need never be opened for test or reset. With no moving parts accessible to the engineer or user, the ReSet is proven to be highly reliable and robust. The ReSet features a warning indicator which drops into view at the top of the window on activation. 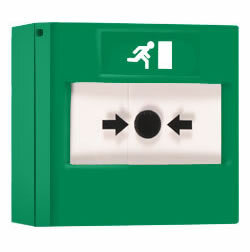 The unit is then simply reset with a special key and is ready for immediate use.